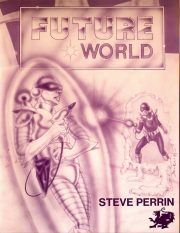 Steve Perrin and Gordon Monson’s FutureWorld was included in Chaosium’s 1982 Worlds of Wonder box set. The set also included the 1980 Basic Roleplaying Game rules, SuperWorld (an early superhero RPG), andMagicWorld (rules for fantasy roleplaying, not tied to any specific setting). Here I am reviewing only FutureWorld. The other parts of the box set fall outside the purview of the BRP review series. My first year at university, I encountered my first roleplaying games; two of those games I still remember fondly. Well, perhaps three, but I’ll explain that in a footnote . The first game was Traveller, which I reviewed here. The second was Chaosium’s RuneQuest, 2nd Edition. Which is now in print again, thank Ghu. Like Traveller, RuneQuest is a skill-based system. Like Traveller, the skills that count are somewhat mundane. However, unlike Traveller, whose basic rule set was quite unspecific about the setting, RuneQuest was explicitly set in Greg Stafford’s Glorantha. I should perhaps add that both games, unlike a lot of role-playing games then and now, are designed to put wandering murder hobos at a considerable disadvantage. Just in case you wondered.